That was worth playing for. Germany's Gnade Esperanza is an all-rounder specifically drivable on Mythical Coast; Go straight after the tunnel, encounter a downhill descent, right turn, and encounter a coastal village inspired on Greek, Mediterrain and Roman villages. An all-American passion, Lizard (Acceron, Bayonet, Hijack, Bulldog) Solely for Over Pass City, full of steep hills in both directions. A well-paved roller coaster that requires cars with insanely high acceleration, if it's to get to the peak. The french legacy, Age (Erisso, Abeille, Pegase, Vanquire) has no fears in taking the most clean corners because of it's powerful handling for Lakeside gate. Winding turns around a lakeside scenery surrounded with waterfalls makes this drive a one to remember. 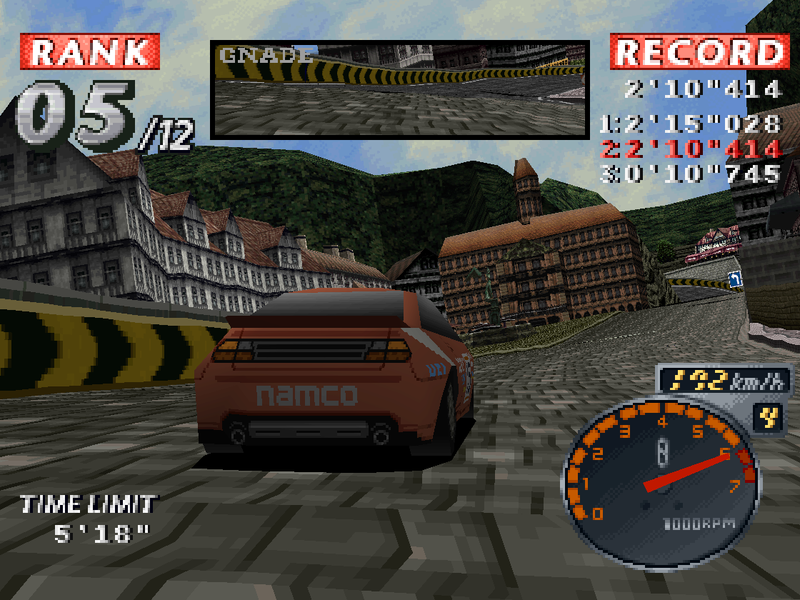 Rage Racer is the 3rd game for the Ridge Racer series. 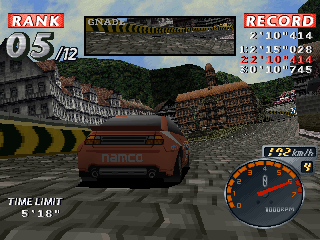 In this game there are options which are not found in the other Ridge Racer games. 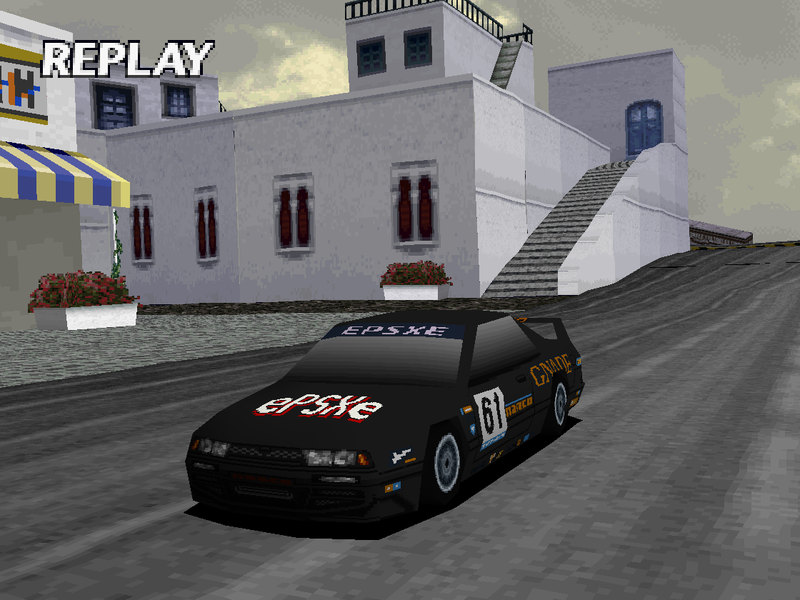 In Rage Racer you can customise cars, create a logo and change tire types from Grip to Drift. 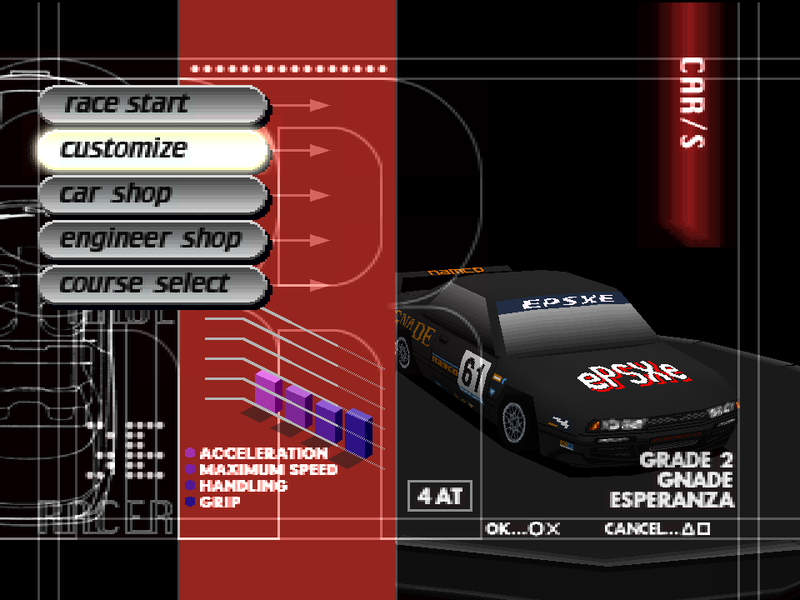 At the start of Rage Racer you get a free car, a Gnade Esperanza. The Esperanza is Grade 1 and is very slow however it will get you through Class 1. When you win a race considering you come 3rd, 2nd or 1st place you will earn credits and these credits will help you buy cars through the game and as you progress through the classes from 1 to 5, the cars you can buy will be faster and the opponents cars will be faster. You can tune up your exsisting cars, this will make them increase in their attributes and will make them go up by 1 grade. All together there are 13 cars available for purchase. 10 of them are purchased in the Grand Prix and Extra GP classes 1-5 (Extra GP is available after completion of the Grand Prix) and when Class 6 is unlocked 3 secret cars are also available for purchase, the Assoluto Squaldon, Age Vainquire and Lizard Bulldog. These cars are the fastest available in the game. 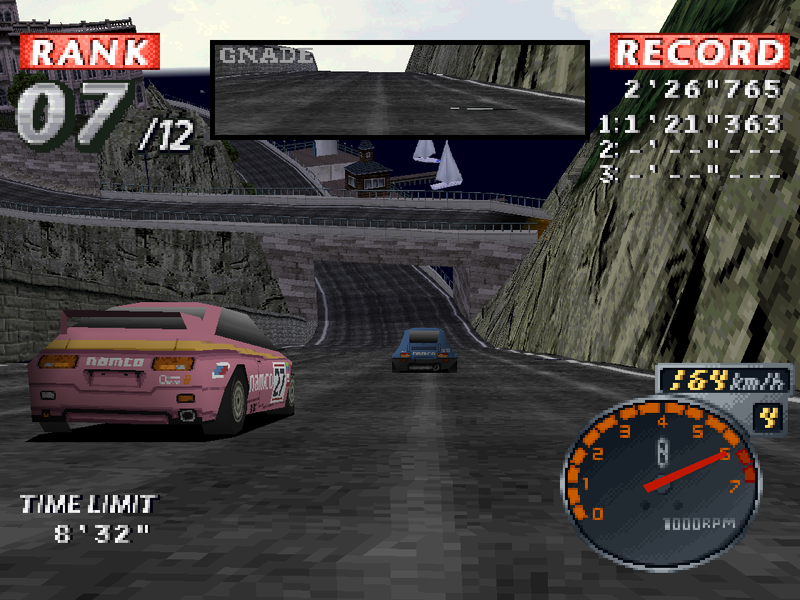 In Class 6, instead of racing against 12 opponents you will only race against 5 opponents. Overall this game is excellent gameplay wise but graphics for an old game are bad. Now you can add videos, screenshots, or other images (cover scans, disc scans, etc.) 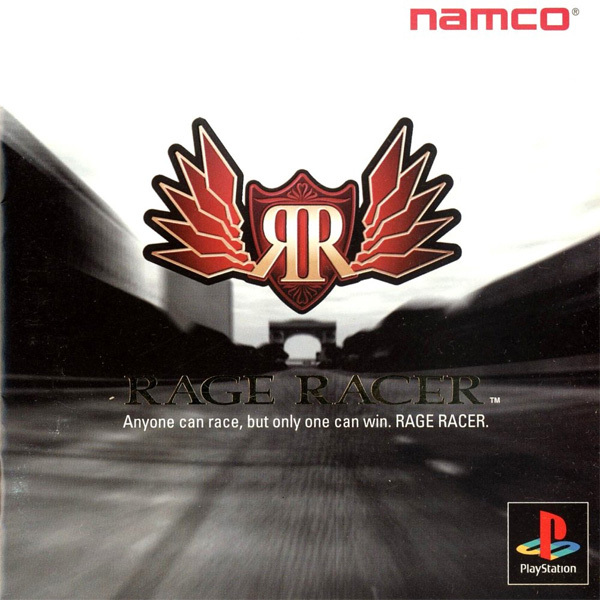 for Rage Racer [U] to Emuparadise. Do it now!